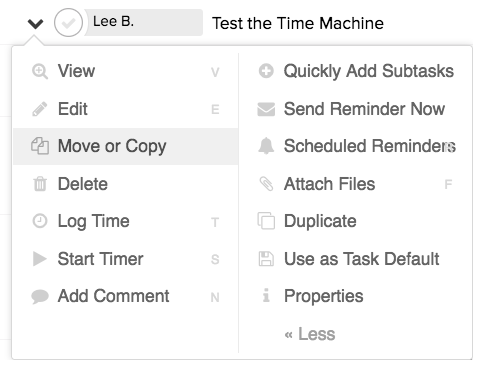 Within Teamwork Projects, you can move tasks from one task list to another. In the Tasks area of your project, if you hover over an individual task, you will see a move icon to the left of the task name. To move a task, just click and drag the task into another list, using the move icon. You can also drag the task over to one of the task lists in the left side pane. In the dropdown menu to the left of the task name, there is also an option to move or copy. In the move or copy modal, once you select Move this Task from the move or copy dropdown, you will also be able to select the project and task list to move the task to. You can move the task to another task list in the same project, or one in a different project.